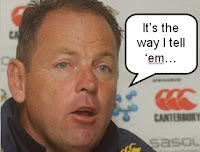 While discussing the various coaching vacancies that he's being linked with after his final game in charge of the Springboks, Jake White has demonstrated that a career in stand-up comedy may be on the cards . "There was one from Wales," he said. "It was a fourth division club called Llantwit Major - a mate of mine is there and he thinks he can get me the job. "He's a bit worried, though, that Graham Henry has also applied."